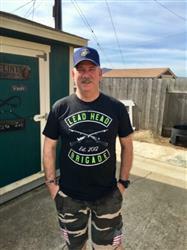 Our new Talking Lead shirt, "Leadhead Brigade" was a fan submission we turned into this design. I was really surprised by how comfortable this shirt was! Im actually wearing it now as I write this review. Very soft, no tags or seams that scratch or rub. Probably the most comfortable t shirt I have. The shirt also looks great and is a great way to show my Lead Head pride! The fabric is shoft, flexible, and breathable. The decal is nice and crisp. I felt very proud the wear this great piece. I love the quality and fit of United 1776 shirts, that is why I have several of them. They always have great designs and subject matter and the Leadhead Brigade is no exception. The shirt is awesome but it runs a little smaller then there other stuff. Great range shirt.